WASHINGTON, D.C. -- Americans' views of the pharmaceutical industry, an often unpopular group that narrowly climbed into the U.S. public's favor last year, slipped back into negative territory in 2015. In Gallup's annual measure of 25 major U.S. business sectors, the percentage of Americans with a positive view of the pharmaceutical industry dropped from 40% in 2014 to 35% this year, while the percentage with a negative view rose from 36% to 43%. This leaves the industry with a negative net-positive rating of -8 in 2015. Gallup annually asks Americans to rate 25 business and industry sectors as part of its August Work and Education poll. Americans rate each industry on a five-point scale ranging from very positive to very negative. The slide in net-positive ratings for the pharmaceutical industry, from +4 to -8, places it among the lowest-rated industries, which include the legal field (-5), the healthcare industry (-6), the oil and gas industry (-13) and the federal government, which comes in dead last (-29). For many years, the U.S. public has had issues with the pharmaceutical industry. As far back as 1991, 73% of Americans said they considered the high cost of prescription drugs an important reason for rising healthcare costs. Since 2001, when Gallup began testing views of major business and industry sectors every year, the public has had an overall positive view of the pharmaceutical industry only three times: 2001, 2003 and 2014. Since 2003, when Gallup expanded the list to 25 industries, the pharmaceutical industry has consistently ranked in the bottom third of sectors. Popular business sectors such as the computer, restaurant and accounting industries have regularly registered net-positive ratings more than 30 points higher than the pharmaceutical industry. Only the oil and gas industry, ranked last 10 times, and the federal government, which took the bottom spot the other three years, have consistently scored lower. The net-positive rating for all industries combined reached its highest point in more than a decade a year ago (+16), and climbed another point this year (+17). In comparing 2014 and 2015, nine industries lost ground this year in their net-positive ratings, but only education's 13-point slide was bigger than the 12-point drop for pharmaceuticals. The pharmaceutical industry's ratings have fluctuated throughout the years, with the variation often mirroring the changes in the overall ratings for all business sectors. The start of the Iraq war in March 2003 seemed to affect many polling measures positively, and the net-positive ratings for industries overall hit an all-time high of +23 in August of that year, with 22 industries gaining ground. It was also the year that the pharmaceutical industry achieved its highest rating of +5. Five years later, the economic crash plummeted the average score for all industries to a -3, with scores gradually improving since then. 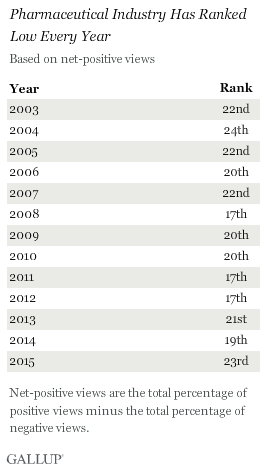 The pharmaceutical industry generally followed the same upward path from 2009 (net-positive rating of -18) to 2014 (+4). However, two of the lowest ratings Americans gave the pharmaceutical industry throughout the years seem to have less to do with the overall mood of the U.S. public. Instead, the net-positive scores of -17 in 2004 and -18 in 2005 likely reflected the major role that attacks on drug companies played in the campaigns of individual Democrats in 2004 and the rocky rollout of the new Medicare plan for prescriptions the following year. 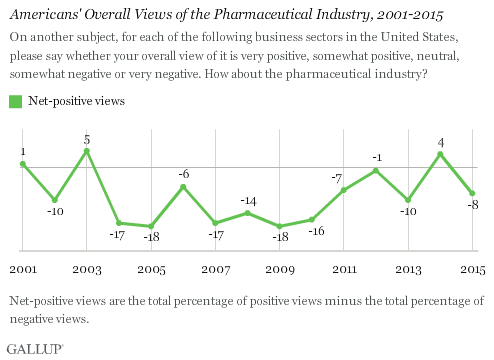 Americans' overall negative rating for the pharmaceutical industry shrank to -6 in 2006, but jumped back to -17 in 2007. The industry had double-digit negative scores in 2008, 2009 and 2010 as the battle waged over the Affordable Care Act, but dropped into single digits after the act passed. Looking at the combined results from the past two years, Republicans give the pharmaceutical industry a +11 net-positive rating, while Democrats rate it at -5. But the differences between the parties shrink considerably when party leaners are included. The rating by Republicans plus leaners drops to +3, and the Democrats-plus-leaners rating rises to -2. Prescription drug prices continue to rise in the U.S., driven partly by the introduction of specialty drugs that can cost as much as $150,000 annually. With few indications that costs will stabilize soon, the issue has moved back onto the national political scene. Vermont Sen. Bernie Sanders, a longtime critic of drug companies who is running for the 2016 Democratic presidential nomination, has announced he will introduce a bill that takes aim at high prescription drug costs through various measures. The combination of constantly rising prices and a presidential campaign in which drug companies are under attack leaves little likelihood that the pharmaceutical industry will gain much ground in public opinion over the next year. Results for this Gallup poll are based on telephone interviews conducted Aug. 5-9, 2015, with a random sample of 1,011 adults, aged 18 and older, living in all 50 U.S. states and the District of Columbia. Six in 10 Americans view the Internet industry either very or somewhat positively, which is easily the highest positive rating for this industry in the past 15 years.